Russia’s Evgenia Medvedeva earns top score in the ladies’ short program at the inaugural 2016 KOSÉ Team Challenge Cup. 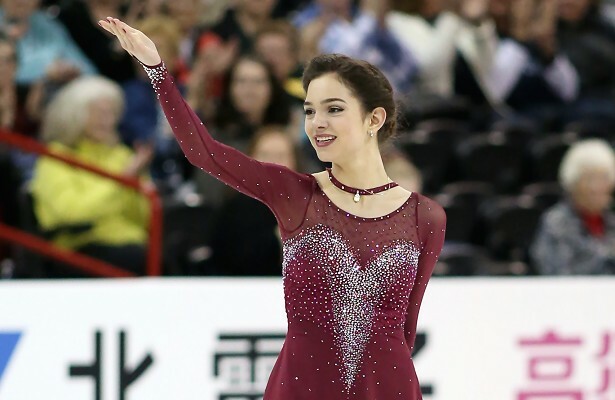 Shortly after finishing her short program to “Melodies of the White Nights,” Russia’s Evgenia Medvedeva smiled and raised her arms in celebration as the audience at Spokane Arena poured loud cheers. Her performance during the head-to-head team singles competition at the inaugural 2016 KOSÉ Team Challenge Cup capped a season full of flawless performance. She earned the top score—77.56 points—and won $5,000 in prize money. Medvedeva made a splash during her debut senior season, winning all the major titles including the Grand Prix Final, the European Figure Skating Championships and, most recently, the World Figure Skating Championships. Her only “loss” came at the Rostelecom Cup last fall, when she placed second to countrywoman Elena Radionova. Therefore, few were surprised when she easily won her head-to-head matchup Friday, but for Medvedeva the performance was still special. The 2016 Russian champion also praised the audience at Spokane Arena, who cheered loudly for every skater and made sure to clap to cheer up skaters who were not doing well. “The American audience was very supportive,” she said. The head-to-head competition kicked off the 2016 KOSÉ Team Challenge Cup. The event continues through Saturday at Spokane Arena in Spokane, Wash. The inaugural Team Challenge Cup, an ISU-sanctioned event organized by U.S. Figure Skating, is featuring 42 figure skaters competing on behalf of three continental teams: Team Asia, Team Europe and Team North America). Each of the three groups featured men and ladies with the same seed. The winner of each matchup earned 12 points; second place earned 10 points and third place earned 8 points. Team Asia won with 64 points. Team North America placed second with 62 points and Team Europe placed third with 54 points. The scores earned during the head-to-head competition will not count toward ISU’s personal or season’s best. The points will also not carry over into the Team Challenge Cup free skate event, which will feature all disciplines, including pairs and ice dance. Medvedeva landed a triple flip-triple toe-loop, triple loop and a double Axel—all in the second half of the program, which earned her additional points in her program. She also landed some jumps with one arm over the head to garner extra points. The 2016 Russian champion had more than a four-point margin on Japan’s Satoko Miyahara to win her matchup. Miyahara skated a flawless routine to “Firedance” that included a triple Lutz-triple toe-loop combination. Miyahara said she was thrilled with her score — 73.28 points — but was also happy that she performed well before a supportive audience. “I wanted them to cheer even more,” the 18-year-old said. Gracie Gold of the United States doubled the first jump of her triple Lutz-triple toe-loop combination in her “El Chocio” program, but landed the rest of her jumps. She finished third with 71.34 points. “I just got a little ahead of myself,” said Gold, 20, adding that she was able to do the rest of her program seamlessly. Gabrielle Daleman, coming off a ninth place finish at the World Championships, won the No. 2 seed matchup with a solid performance of “You Have to Swing It (Mr. Paganini)” that earned her 68.45 points. Her triple Lutz had a scratchy landing, but she nailed her triple-toe loop-triple toe-loop combination, and earned 68.45 points. Overall, the 2015 Canadian champion felt it was solid performance after her long season, which started back in August. “It proves how much my skating has progressed this year,” the 18-year-old said. Roberta Rodeghiero of Italy skated a clean performance to “He Sleeps” by James Newton Howard and “Pretty Woman” by Roy Orbison that included a triple toe-loop-triple toe-loop combination. The 26-year-old placed second and earned 61.75 points. Rika Hongo of Japan popped a planned triple flip into a double in her “Incantation” program. The 18-year-old earned zero points for the jump, but recovered with a triple toe-loop-triple toe-loop in the second half the program. She finished third with 60.43 points. The confidence that helped USA’s Ashley Wagner earn her silver medal at the Worlds championships last month was on full display in her “Hip Hip Chin Chin” short program. As Wagner landed her jumps, including a triple flip-triple-toe loop combination, she kept her performance to a high level, prompting loud cheers from the audience. Continued improvement on her triple-triple combination, a must-have in ladies’ figure skating, made her cheer as well. “I feel my triple-triple has become stronger since Worlds,” the 24-year-old said. She earned 74.54 points to win the No. 3 seed matchup. She hopes to build on this performance and continue to progress toward what she hopes is a spot on the Olympic team in 2018. “This is more for mental practice for me and sticking to the technique that Rafael (Arutyunyan) and I worked so hard for under pressure,” she said. Kazakhstan’s Elizabet Tursynbayeva’s “I Got Rhythm” program featured a triple Salchow-triple toe loop in the second half, and a sassy step sequence that was well received by the audience. She placed second with 65.44 points. Elena Radionova of Russia had struggled with all her jumps in her “Je t’aime” program. She had a rough landing on her triple Lutz and was unable to add the planned triple toe-loop. The 17-year-old attempted to add the triple toe to her triple flip, but fell. She also popped her double Axel and she earned no points for the element. She placed third with 61.36 points.